“Teenage twins Luke and Matt Goss were less than a month short of turning 20 years old when they arrived at BBC Pebble Mill by helicopter. They were adorned with their trademark slicked back hair, fake tans, selfie-style poses and some very 80s’ clothing – the perfect pop package. Their mission? To switch on Radio 1’s new FM signal in the Midlands in front of hundreds of screaming fans……. 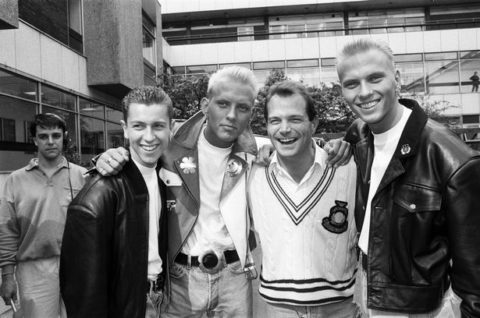 Luke and Matt Goss were joined by fellow band member Craig Logan when they arrived at BBC Pebble Mill on Thursday, September 1, 1988…. Hundreds of young, screaming girls besieged Pebble Mill were the group was paying a flying visit by helicopter to officially inaugurate the new service.